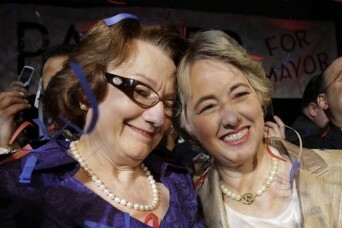 Houston Mayor Annise Parker, right, and new wife Kathy Hubbard, her parnter of 23 years. Houston Mayor Annise Parker tied the knot with longtime partner Kathy Hubbard in a Jan. 16 ceremony in Palm Springs, Calif. ABC Eyewitness News 13 reports that the couple was married before an intimate group of friends and family, which included Parker’s mother and Hubbard’s sister, on the 23rd anniversary of their relationship. Officiating was Rev. Paul Fromberg of San Francisco’s St. Gregory of Nyssa Episcopal Church, who is also a family friend,according to media reports. Posted January 18th, 2014 & filed under News, Politics.